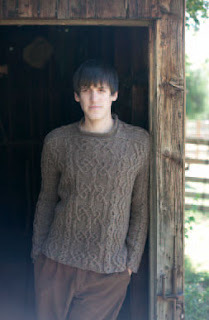 Designers have started uploading photos to Ravelry for Jane Austen Knits 2011 [link], so I realized it was time to add mine. 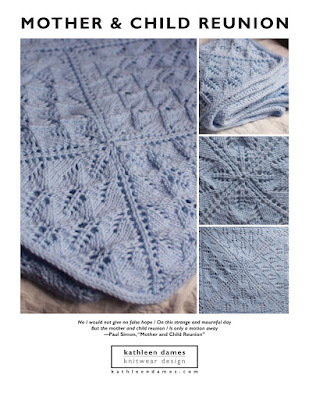 If you can't wait for the print versions to show up at your LYS next month, you can purchase the digital edition from Interweave's site [link]. 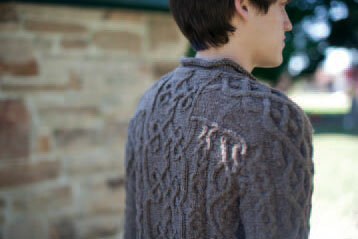 My contribution is called An Aran for Frederick [link] - a men's cabled pullover knit in the round with an EZ-style hybrid yoke to show off all those amazing cables. 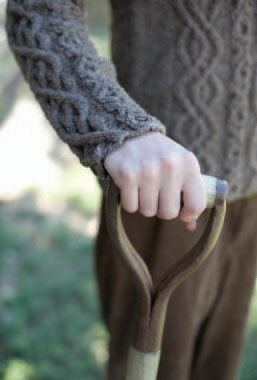 You can also see a little of the sweater in Catherine Shields's Fitz fingerless mitts [link]. This bundle of cable-y goodness was knit up in Brooklyn Tweed's Shelter, which I really enjoyed working with. Most of the time I work with Worsted-spun yarn, like tosh dk, so working with a Woolen-spun yarn was interesting. There is a fluffiness to it, and yet the cables really pop. Plus, it spit-splices like a dream, which is perfect for a sweater knit in the round. I only had to weave in the cast-on and bind-off ends, as well as the underarm Kitchener-ed ends. Ever since I read Elizabeth Zimmermann's description of the hybrid yoke, I've wanted to see what would happen if you tossed cables in there, winding up the arms and shoulders, climbing up the back. So, when submissions for Jane Austen Knits were called, it seemed like the right time to explore this idea. Persuasion is my favorite of Austen's novels, closest to my own story, and I thought a sweater inspired by Captain Wentworth was a great idea. Happily, clever editor Amy Clarke Moore agreed, and I was able to work some Frederick-themed cables into a handsome, strong-shouldered sweater. I hope you like it! And the best news is that Interweave is already planning another edition for 2012 - call for submissions may be found here.